WOW! This huge megalith is so impressive. 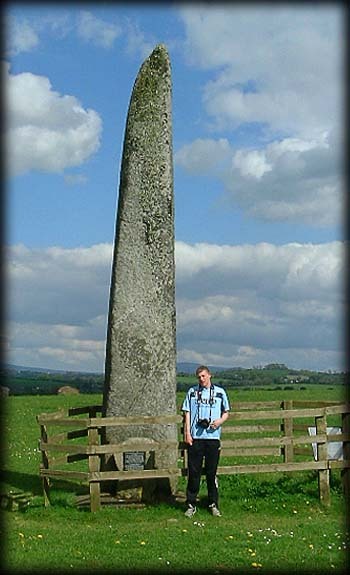 Standing at 6 metres high, the Punchestown long stone is the tallest of several large megalithic monuments in Co Kildare. In 1931 the monument fell and was measured at almost 7 metres in length and weighed about 9 tons. The stone is almost square at the base, gradually tapering to the wedge shaped top. In 1934 the stone was re-erected, by placing it back into it's stone lined socket. This stone was originally set at an angle. A Bronze Age cist grave was found at the base of the megalith but it contained no artifacts. Since my last visit I believe it is quite difficult to gain access to this wondrous stone. If you are lucky enough to gain access you will appreciate it's size more if you can stand under it. This is one of quite a few large monoliths in the vicinity. Craddockstown West, another tilted stone is not far from here, as well as the impressive stone at Forenaghts Great. 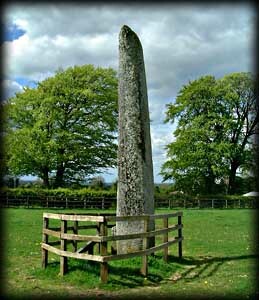 There is also another four metre long megalith lying in a recumbent position in the townland of Longstone. We hope to photograph the latter two monoliths sometime soon. Situated: From Naas take the R411, then take a left turn for Punchestown racecourse. Drive past the main racecourse entrance, after 500 metres you will see this huge megalith in a field on your right.